Let us create some amazing photographs for you! This was a personal, commercial photography project to recreate the “Cold Souls” movie poster, originally starring Ryan Reynolds & Ben Kingsley. This was a personal, commercial photography project to recreate the “Cold Souls” movie poster. Product photography for a Sig Sauer P238, with a black textured background, ammo, and a spare clip. A professional portrait of a business man. Mountain Biker, Jeff Lenosky, jumping some kids during a stunt show in Indianapolis, IN. Indianapolis Indiana downtown--a photography composite of key landmarks, buildings, museums, and monuments. 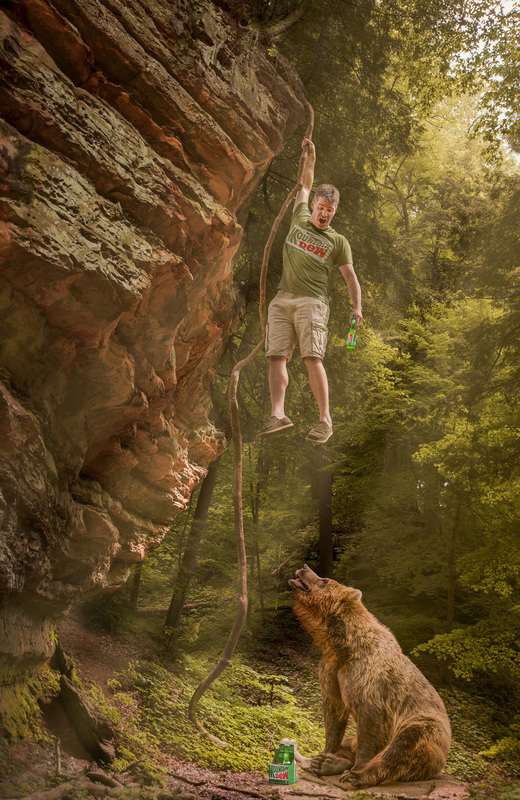 A man climbing a vine, up a cliff, away from a bear, with Mountain Dew. This is a photo composite image of a lion on a Jeep by a lizard. All images are original: Garden of the Gods in CO; dry lake bed in Gray, TN; lion & lizard from the Indianapolis Zoo; Jeep from Indianapolis War Bird Expo 2015. Taekwondo boy kicking at his belts. This image is from a personal photography project of a Taekwondo boy kicking at his belts. This was a creative concept used to show the belts that the student had earned. Read more about this project in my Taekwondo Boy project post. We photographed this image in my home studio here in Indianapolis, Indiana. Taekwondo boy kicking a board. This image is from a personal photography project of a Taekwondo boy. Read more about this project in my Taekwondo Boy project post. We captured this image of him breaking a board by kicking it with his foot. We photographed this image in my home studio here in Indianapolis, Indiana. This photograph was made as part of a personal project for a concept that I had to create a unique family portrait. This photo is a composite of multiple shots in order to bring it all together. Read my blog post on this shoot and watch the BTS video. This photography was made for Carmine Azzato for use in his book cover. You can read more about this project here: Book Cover for "Wounded Healers", for Carmine 'Blast' Azzato. We photographed this image in my home studio here in Indianapolis, Indiana. This photography was made for Carmine Azzato for use for his signed 8x10s. Read more about this project here: Book Cover for "Wounded Healers", for Carmine 'Blast' Azzato. We photographed this image in my home studio here in Indianapolis, Indiana. Personal Photography Project: Man on a Wire. This photograph was made as part of a personal project for a concept that I had to show a man with wings, sitting on a power line. This photo was built by combining only two images: the background, and the man. This photograph was made as part of a personal project for a concept that I had to show a man worshipping God, and fire coming down on him from heaven. Multiple images were composited together in Photoshop to build this image. This photograph was part of a personal photography project. This started as a concept that I had to make a very interesting and exciting photo of a boy scientist. I built this set and used a smoke machine to show a rocket taking off from inside the boy's lab. 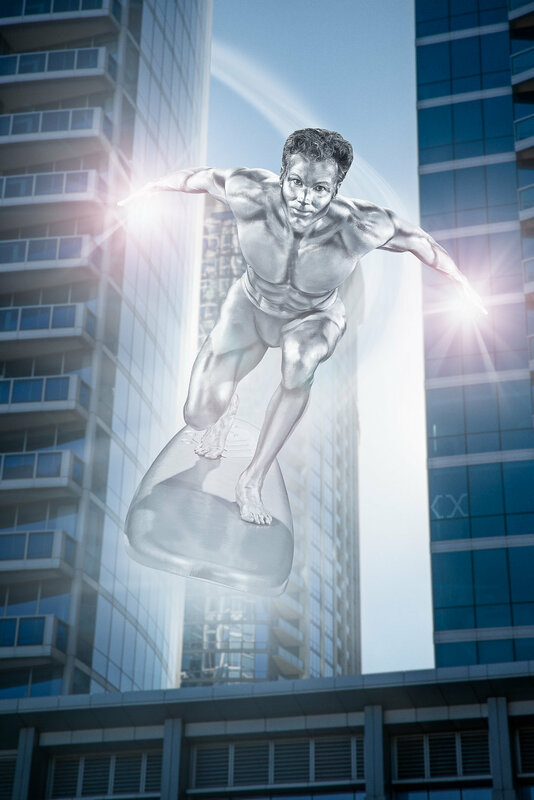 This photograph was taken as part of a personal concept test shoot on levitation. A potential client was looking to have a levitation shot for an album cover, so I worked on this personal project to test the concept. St. John the Evangelist Catholic Church, in downtown Indianapolis, IN, by photographer Kevin Lee Medlin. The birds were added as part of this composite image. CX Photo Works is a professional photography studio in Indianapolis, IN, owned by photographer Kevin Lee Medlin. We are a professional, advertising, commercial, and corporate photography company, specializing in creative, digital photography, retouching, compositing, photo manipulation, and post production. Need a creative solution? Looking for a creative approach? We'll work with you from concept to final images to meet your needs. Contact me.